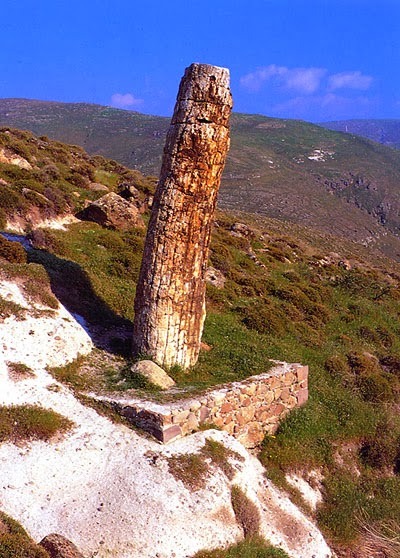 "In western Lesvos, natural erosion is gradually bringing to light fossilized pieces of trees which, in the remote past, were once alive. They have been there for years beyond computation, witnesses to an unrepeatable act of creation, monuments of nature. Hephaestus, the ancient god of fire, robbed these trees of life in a mighty paroxysm, granting them immortality instead. Their colours are bright, unbelievably vivid, so that they stand out from the ash and the greys of the volcanic rocks which surround them. The differing shades of red, yellow and chestnut, of green and of black are innumerable. Tints of saffron, carmine, and violet, shading into deep blue, in unusual combinations, dazzle the eye of the visitor. This is an entirely different world, totally still, but at the same time so full of life".